Cabbage love is shared by Northerners and Southerners alike. We may disagree on politics, who’s number one in college football, and guns but we do like our green cabbage. Stuffed, fried, in soup, and just plain ol’ boiled it is on the national menu. A few years ago I had lunch at a buffet restaurant in Vidalia, LA. Boiled cabbage practically needed its’ own staff to replenish the supply!! The cook was vague about her special cabbage recipe, so it’s a good excuse for a bike ride to The Killer’s old stomping grounds. By the way, he just married for the 7th time.Cabbage is plentiful and cheap around these parts now, which is perfect for us scrounging people. The following is a Southern Bohunk casserole which honors our shared Irish roots and my bohunk father. Since last week I’ve been a substitute lunch lady at elementary school’s child nutrition program – back in my mass quantity groove! Feeding 1,500 hungry young’uns breakfast and lunch has me falling asleep easily at night! 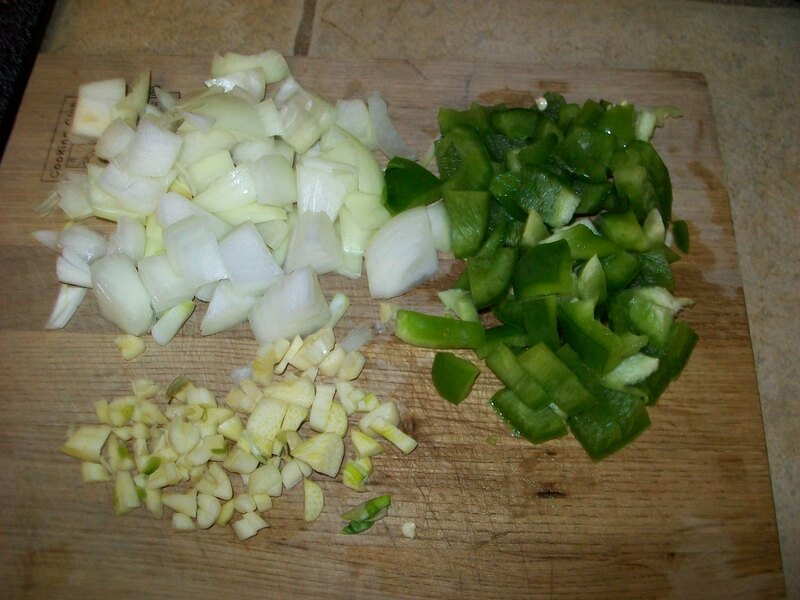 Cook the meat, onions, green pepper and garlic in a 12″ skillet until the meat is browned (slight crust) and vegetables are tender. Drain any accumulated fat. While the meat cooks, put the sliced cabbage in a 2 quart covered casserole and microwave about 5-7 minutes on high until the cabbage is softened but not mushy. There is no need to add water. 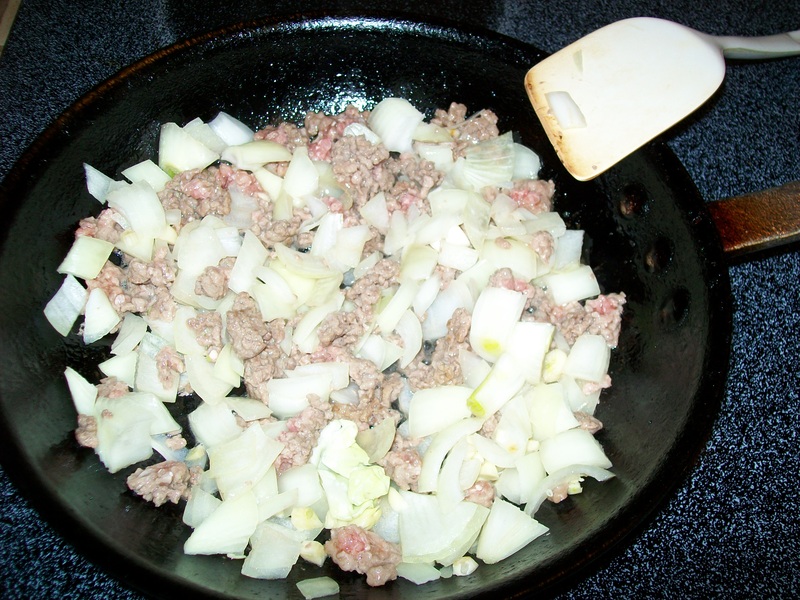 Reduce the skillet’s heat to low and add the spices and tomatoes to the meat mixture. Stir while the mixture reduces slightly, 1-2 minutes. Remove skillet from heat. Take about half the cabbage from the casserole; set on a plate (or casserole lid; I am lazy about washing dishes). 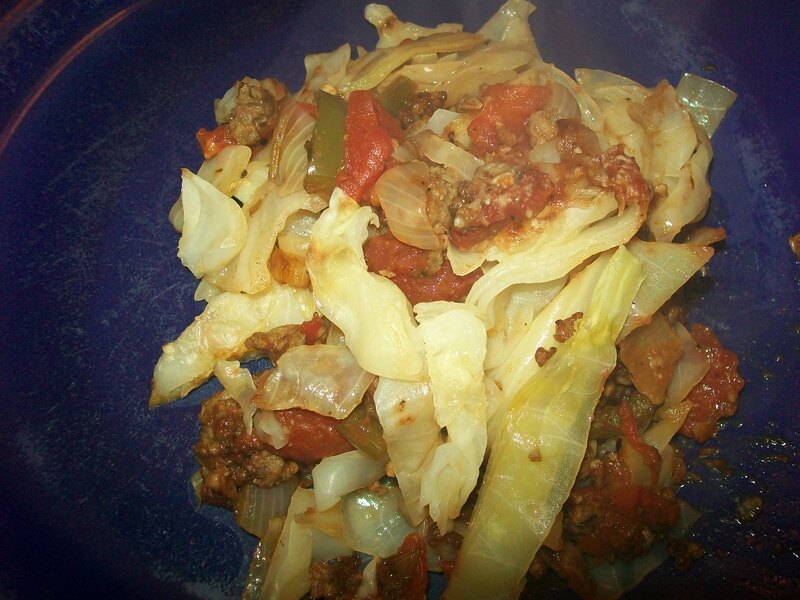 Place half the meat mixture on the cabbage in the casserole. Sprinkle with 2 tablespoons of cheese (if using). 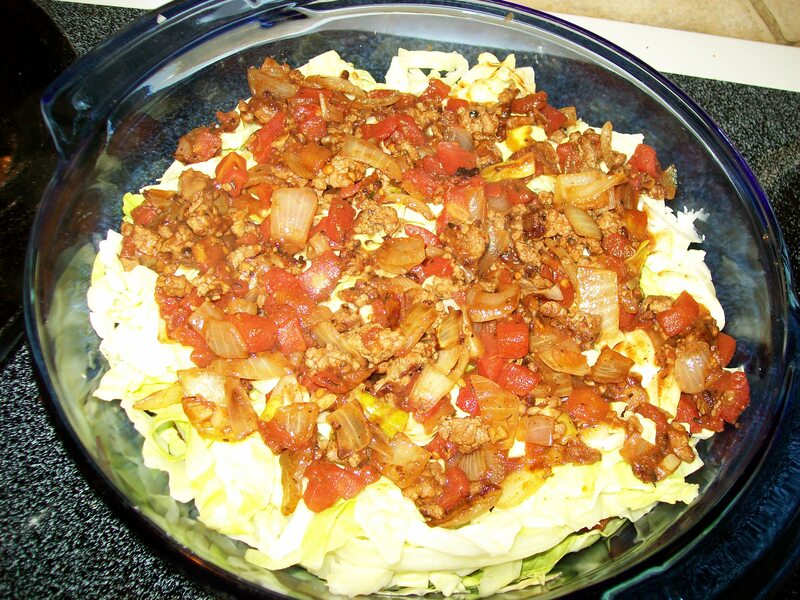 Put remainder of cabbage on the meat, then layer the rest of the meat mixture on the cabbage. Add 2 tablespoons cheese (if using). Cover casserole and return to the microwave and cook for about 10 minutes on high. Let set covered for about 2-3 minutes. Be careful when removing the lid – there will be lots of steam (and steam burns are no fun, believe me). Enjoy with beer (Guinness or PBR suggested) and crusty bread. And lunch for 1,500 schoolkids? Oh my gosh. The quantities you must work with must be gigantic! Quantities are huge – the key to not being overwhelmed is focusing just on the task in front of you, literally! And using both hands.